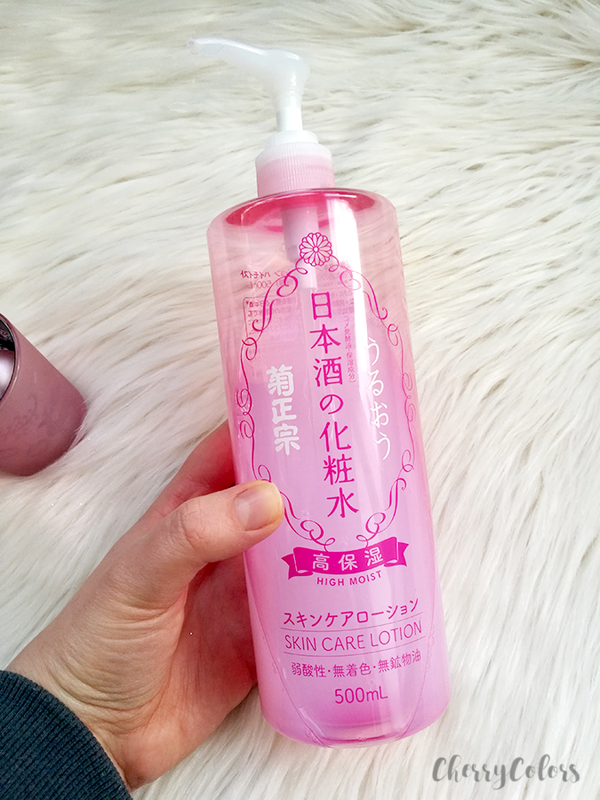 Kikumasamune HIGH MOIST Sake Lotion - Cherry Colors - Cosmetics Heaven! When I first saw this packaging at a meeting (aka a party) I was kind of curious. It looked a bit off and reminded me of a body lotion. I mean that's what I thought it was because of the only legible thing on it says "skin care lotion". But it turns out it's much more than just that. It's a hydrating toner that is very praised amongst Asian skincare fans. Of course, I'm talking about the Kikumasamune HIGH MOIST Sake Lotion. ... is an ultra-hydrating Japanese lotion with sake. I mean, it's huge. That means that yes, you have to be creative with using it up. See, it's big. And yes, I'm still not over that. Most toners contain max 250ml of product. Usually even less. But okay, I wouldn't be writing this review if it was just big, would I? The lotion has a light sake scent if you use it without a cotton pad. If you use it with a cotton pad the light sake scent turns into a bubblegum scent. I find it really interesting but luckily the scent vanishes after application. The thing that impressed me the most is how hydrating it is. Before it, I was using hyaluronic acid serums to add a boost of moisture to my skin. But sometimes it just wasn't enough. Well, with this "lotion" I could skip the hyaluronic acid and use a cream over it. My complex skincare routine got reduced to three steps. The lotion is highly moisturizing and really I don't think I'll ever go back to plain hyaluronic acid. This is a godsend and I'm so happy that my skin is reacting nicely to it. Otherwise, I'd be stuck with a huge bottle. The bottle has even a pump that can be closed (pushed down and locked) for travel purposes. It's a bit messy to do so, but I'm glad that this option exists. The hydration lasts for a long time and that's one of the reasons that excite me about it. The second is that this huge bottle is only about $13! I love it so much that I thought about getting a backup, but then again I still have 1/2 of it left ... I'll wait. From me, it gets 5 cherries as it checks all the boxes I need in a product. It moisturizes (delivers the claims), you get a lot of it and it's inexpensive. It's ultra moisturizing and that's something I wasn't expecting from it but I'm loving. I started using it as a body lotion before using a body butter, just to use it up quicker. The bottle is huge and pink which is a plus. The scent is very ... sake-like but if you use with a cotton pad (you'll use it quicker) it smells like bubble gum. Fascinating! This bugger surprised me and I'm keeping it in my routine.